The jackets have a drawstring around the neck area which poses a strangulation hazard to children. Drawstrings can become entangled or caught on playground slides, hand rails, school bus doors or other moving objects, posing a significant strangulation and/or entanglement hazard to children. In February 1996, CPSC issued guidelines about drawstrings in children's upper outerwear. In 1997, those guidelines were incorporated into a voluntary standard. Then, in July 2011, based on the guidelines and voluntary standard, CPSC issued a federal regulation. CPSC's actions demonstrate a commitment to help prevent children from strangling or getting entangled on neck and waist drawstrings in upper outerwear, such as jackets and sweatshirts. Swimwear Anywhere at (800) 647-6335 from 9 a.m. to 5:30 p.m. ET Monday through Friday or online atwww.swimwearanywhere.com and click on the Recall tab located under the LINKS section on the bottom left side of the homepage. This recall involves the Little Marc Jacobs girl’s hooded pull-over swimwear cover up jacket made of 100% cotton. 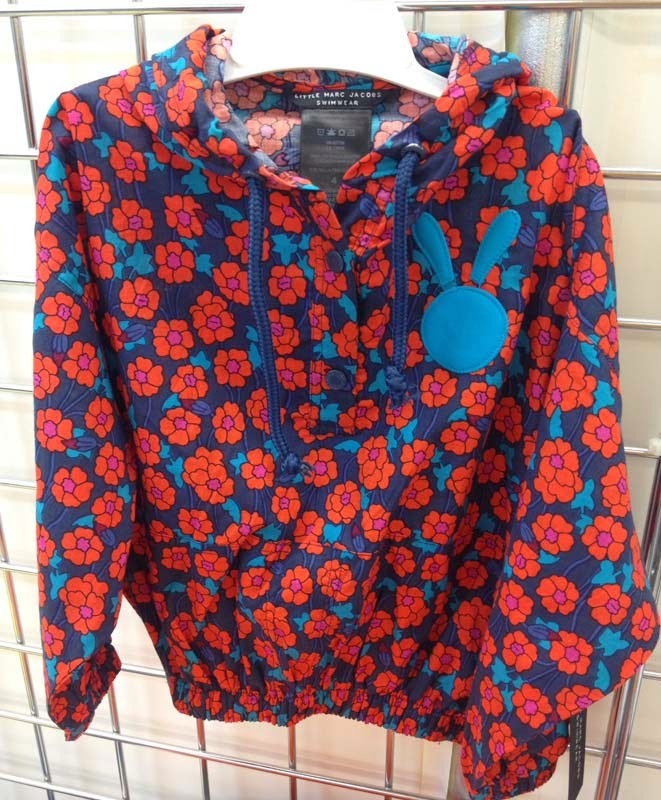 The jackets are navy with red flowers and teal leaves and have a teal bunny appliqué and two buttons on the front. They were sold in girl’s sizes 2 through 12. Little Marc Jacobs Swimwear, style number LM28616, Lot #1 and the size are printed on the black sewn-in label at the center back of the jackets. Consumers should immediately take the jackets away from children. Consumers can remove the drawstring from the jacket to eliminate the hazard or return it to the place of purchase for a full refund. Swimwear Anywhere Outlet, children’s boutiques and other specialty retail stores nationwide and online atwww.swimwearanywhere.com from January 2014 through July 2014 for about $89. Swimwear Anywhere, Inc., of New York, N.Y.